Streaming Video Recorder is a comprehensive and excellent video recorder. It can help users record videos or audio from almost all mainstream sites, as well as millions of other websites. The built-in sniffer can automatically detect and save videos from all popular media protocols (HTTP, HTTPS, FTP, RTMP and RTSP). 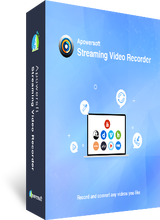 What’s more, this handy tool also provides users with other practical functions, such as Video Converter, Screen Recorder, Audio Editor, etc. Add Accounts to Record Some Private Videos.